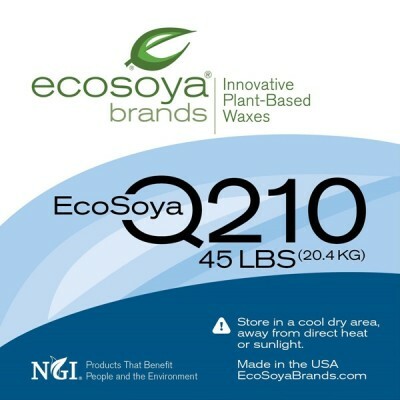 To find out more information about the new Ecosoya Q210 wax read out blog post here. Suggested Applications: Container candles, tarts and melts. This was has been dermatologically tested and is also great for massage candles. Description: The Q210 soy wax which is part of the new Ecosoya range, is the newest soy wax from EcoSoya brings a new technology that virtually eliminates frosting, allows for higher fragrance loads, higher pour temperatures and produces vivid colors. The Q210 has an extremely clean burn, stable and easy to use. One pour with a smooth re-congealed burn pool. Please note: The wax information is a recommendation only and your own testing should be conducted. I have never tried making candles before, so I'm no expert, but this wax was absolutely brilliant. Didn't notice any weird smell when melting, scent throw is great at 10% and candles have turned out perfectly. No frosting, no sink holes or bubbles and perfect smooth tops. I have only made small batches of 3 candles at a time, so maybe melting in quantity is an issue, but for me it was very easy to use. I'm very surprised reading all the bad reviews on this product. I've used 10kg in the past few weeks to make melts and have not had many issues. I've been pouring at a lower temp (50°c) due to using small portion containers. I've found maybe 5 out of 500 I've made get bubbles in them. I havent had an issue with scent throw (I use 10-12% fragrance) I can smell it for ages after making them and if I've got two different fragrances the same colour I can smell the difference when I get to labeling them. The ones I've used in a melt warmer also had great scent throw. I've found if I get distracted and heat the wax too much it does make a difference to the colour (my purple went grey as it was too hot) but otherwise my colours have been very vibrant. I did find tho that when I was at the markets the other day in the short period they were in the sun (silly me didnt take a side wall for my gazebo) they did sweat and the pink, purple & red ones went completely white. I was quiet surprised how quickly it lost colour in the sun. I have not used them for candles in glass jars as I found when I used the other wax (Q230) it did not adhere very well to glass and frosted alot, so I wasnt game.to try candles with the Q210. Only got 5kg's of this wax thankfully! it is peach in colour. Smokes for ages when first lit, even though wick is continually trimmed. Can't smell fragrance unless using 15% or more. Nothing good to say about it. Won't buy again. Very unhappy about the wick still smoking after being extinguished. The scent throw is less and depending on the fragrance the wax does change colour. Followed instructions and tried different fragrances but every candle on had wet spots. To the point where my tins oxidized from where the fragrance sat on top of the wax and touched the tin. the worst part is i have tripled my cost in scents as the 18% advertised with better scent throw i can tell you after working my way through 1/2 of the 20 kg thinking what am i doing wrong its not me, its this dreadful wax as the scent throw is ZERO. I will be going back to my previous Golden Wax. I am about to bin the rest of this its cost my business in sales and time. Best wax we have ever used. No frosting the scent throw is fabulous (15%) is what we use. It holds the colour no smoking at all. Really not happy with this wax at all,the only good thing is how well it hold color.The scent throw is terrible it sweats very easily and the wax itself smells almost off! It has cost me money in sales and trying different ratios,I really hate this wax and am looking for a quality replacement!! Any ideas?? This wax might have a beautiful appearance and hold colour well but the scent throw is non existent. The vinegar smell of the wax is unappealing. I don't know how this wax got past Ecosoya's testing stage. Really hope they address these isssues. Was so excited to try this wax when it came out, however, after using it for a few months it's terrible for candles which is disappointing. This wax is garbage for making container candles and I can't wait for Eroma to stock CB Advanced again! Ran out of CB135 in early December...found this as a possible solution. Holiday demand required me to limit testing...now I can't sell any holiday candles at my event this weekend. . No scent throw with essential oils....have to pour at 140 degrees as millions of bubbles form at 120 and below causing bubbles in poured product. I don't like to add essential oils at that high a temp. I thought that was why I had no scent throw but after reading these other reviews, I see it's not just that. Looking for a replacement, any suggestions for one making essential oil scented candles? The old CB advanced is far superior to this poor excuse for wax. I'm so surprised Ecosoya would put their name to this product! Its just awful. - The wicks die/drown out half way through in certain scents. And other scents need to be wicked up 1-2 sizes. - If your wicks manage to survive past half way, the scent throw takes on a "smokey" scent. Anyone who has left positive feedback for this, I would question whether they tested the whole candle all the way to the bottom. After making the candle initially, it does look nice, smooth and creamy. After the first burn, it still has a nice appearance. But once your 1/3 of your way into the candle, get ready for problems. I'm so disappointed in this wax. Ecosoya had a great product with CB advanced. They pulled it off the market, kept us waiting months and months, and for what? this?! Really looked forward to trying this wax. Used a 14% fragrance load and candles poured quite well and smelt quite strongly. These were poured for Christmas at the end of October. I followed the pouring instructions carefully and added the fragrance and pored in the lower end of the poring window. I have found that 2 of my 5 fragrances is virtually undetectable, a third is extremely faint and the last 2 have a light fragrance. Between the high cost of the wax and the cost of the fragrances together with the many candles I cannot sell, I will not buy this wax ever again. Candles are smoother and have a nice finish. However the biggest down side for me is the fact that I need to use nearly double the amount of fragrance oils to get the same scent throw as my old wax. So on top of spending more money on a more expensive wax I now have to add more fragrance oil to each candle making them much more expensive to make. I was so worried about this wax after reading so many bad reviews after I had ordered over 50kg of it for the Christmas period (yikes!) and I was pleasantly surprised! I am getting great Cold Throw and Hot Throw (loading 10-12%) my tops are perfect and colour vibrant! I am adding the fragrance oil and pouring lower than recommended temperature (adding fragrance oil 69°C and pouring 65°C) with fabulous results. A few of my candles are pulling away from the container but overall happy with the results I'm getting! There is almost no scent throw, hot or cold from this wax. Very disappointing. I have made heaps of clamshell and melts, and after two weeks the are all getting black spots on the bottom and now everywhere..
Not sure what i did wrong maybe anybody has some suggestions or tips. Love it, easy to use. Only downside for melts, it is hard to get out of the mould and the fragrance does not last as long as the Ecosoya Pillar Blend. I've done quite a bit of testing with this new wax. Comparing it to CB Advanced. More smoking when you extinguish the candle. Colour isn't great (turns a weird peachy colour with some fragrances). French Pear looks an awful brown colour after burning it (no colour added). I think the cold throw of some fragrances is not as strong. Need higher FO % to get the same scent throw. Can pour at hotter temp. Candle tops set nicely (other than some being a bit too concave). This is not an improvement on cb advanced. Easy to work with and sets really well. Only down side is it is a cream colour not the crisp white that Cb Advanced was. Just finished my first pour with this wax and it is just a timesaver! All my candles are perfect! No second pour needed to cover cracks etc. For melts this wax makes the melts feel oily and soft. Im a bit deflated. Smaller quantity for more $$, also not as soft to what Im used to. This wax sure is harder and the smell not as strong when unlit. ( Im used to customers saying " oh gosh, smell that, its amazing" you dont get that with this wax unfortunately :( You might want to wick up a size bigger than normal too. The good thing about this wax is smooth tops, even after the test burn it sets like new almost. And yes no frosting. After making 24 large jar candles, I have only had 1 with good adhesion. It didn't make any difference if I warmed the jars before pouring. Cold throw was not the best. Hot throw on a few testers was okay. The wax when cured is a light apricot color.the only thing I liked was a lovely smooth top. I was excited to get my hands on this new wax and really hoped it would deliver but I'm quite disappointed. Whilst the finish was smooth, the dark caramel colour of the wax once melted and set isn't appealing. The cold throw is also almost non existent. One test batch had a plastic smell to wax (possible not enough fragrance even at 13-14%). You'll definitely need to up the fragrance with this wax to cover the plastic smell. Here's to hoping the other deliver better results. I have now tried Q210 and for me it's not living up to my expectations after reading how fantastic this wax is supposed to be. Before I used Xcel for my tealights and CB Advanced for my containers and I never had any issues with wicking, fragrances or funny looking surfaces. I have so far mainly tested only the wax with HTP wicks in different containers without anything added. Sorry to say that I am very disappointed. I will continue my testing though and try CDN wicks as well to see if they work better. Looking forward to trying the other waxes in the Quantum series to see if they perform better. I hope this was helpful to someone. Definitely harder than CB Advanced and I had to wick up with all my containers. If I poured the wax below 75 degrees the wax retracted from the cointainer wall. My bigger candles also got concave and sunken in the middle and needed a second pour. Easy to get both soft and vivid colors. Made some tealights and tested a 14% fragrance load but disappointingly they don't burn well at all as the wick can't handle it and almost drowns itself. There is almost no cold scent throw at all but very good hot scent throw. No frosting. I also got wetspots if poured below 75 degrees and in room temperatured containers, had to preheat them. For me this wax is not satisfactory and I am disappointed since the reviews have all been very positive. I will keep testing but looking forward to the other new waxes. Harder than CB Advanced, you might have to wick up with some candles. Holds colour well, no frosting. Good hot and cold scent throw.